Will be the music of their wings. Confused yet? As I explained last time, it seemed to me that if a truly miraculous occurrence were actually recorded, I doubt if we would be able to quite take it in. We would find it sort of unsettling, but fascinating. I think the story of it would reappear from time to time, always layered with the kind of window dressing that we use both to point out what is wonderful but also, in a way, to cover it up. For now, we’re still in the dark about what the original Miracle of the Geese was, but in chapter 11, the girls are treated to a movie night where they see Swancall with their mothers. So we’re not ready for the ’60s yet, but maybe we can handle the ’80s. It was so much fun trying to re-create these kinds of movies. Will kids growing up now be able to relate to the kinds of cheesy, improbable but awesome movies that I’m talking about? 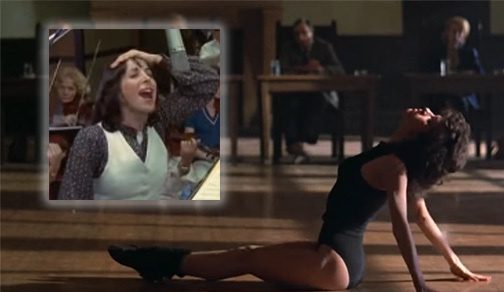 I’m thinking of Flashdance (big ending scene HERE, because you know you want to see it again). Not to mention Fame, Footloose and Dirty Dancing, where giant song and dance numbers appear magically to wrap up wildly improbable plots and supply fantastic escape. Perhaps not, which is why the girls in the Club are split. Vanessa and Photini both get carried away with the emotionalism of it, whereas Xenia is turned off by that. Abigail is just puzzled by the movie, and Maggie can’t help but notice how dated it seems. Which I’m sure it would. All the same, there was still a certain magic that those movies had — something that guaranteed that they would be cult classics. I love these old movies. But they have a strange idea about what constitutes a great moment in your life. So that’s one element of Swancall. Another is that there’s something that “feels” religious and spiritual about it, especially a song that is adopted by Christians. I was thinking of “You Light Up My Life,” which came out in 1977. I didn’t see this movie myself, but I really didn’t have to. The movie was just an excuse for that song, right? You can see that HERE. So how does all of this old stuff fit in with our story? I think for secular people, these sorts of sweeping, emotional expressions are vehicles. They carry the whispers of things that go beyond our senses and past our thoughts. Big songs and big dances are just excuses to talk about what reaches us at both our most primitive and our most human levels. They become ways to express longing and depth when words alone won’t do it. I suppose I’m saying that as silly as they are sometimes, and as un-Christian and even anti-Christian as they try to be, they capture something that is, in its own way, miraculous. For Vanessa, that big ending in Swancall seems so uplifting. And it gives her a sense of how miracles should look, should feel. That will give her a necessary boost going forward, but it will also pose a kind of temptation. What will she do with that?